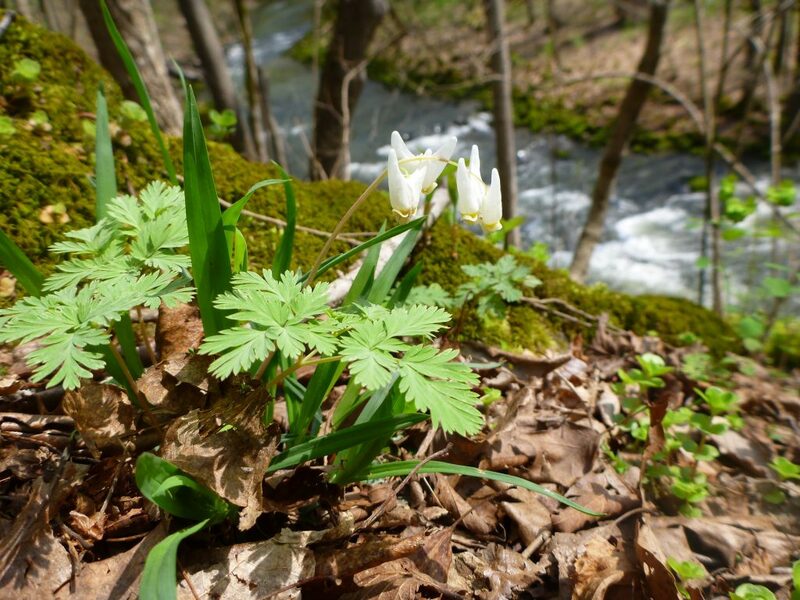 Dutchman’s-breeches bloom along a ravine. When I was living outside Ohio several decades ago, a good friend used to refer to my home state as “the flatlands,” referencing how glaciers had scoured away many peaks and valleys of the landscape. But Ohio is no Kansas. Columbus’ Park of Roses isn’t just a glorious romp of color and fragrance with 12,000 rosebushes on its 13 acres. The park is also a memorial to many, an homage to others. Walking the wide paths, I spend almost as much time wondering about the people named on the rectangular green plaques as I do about the flowers themselves. Every person honored had a story, someone who loved him or her. After my father died in 1998, I adopted a rose bed in honor of my parents. My mother, who had died years earlier, loved roses, and I still remember the names of ones she grew. Peace, the yellow hybrid tea with a blush of pink on its petals, exudes a heavenly, sweet fragrance. Dr. W. Van Fleet is a climber with pale pink roses that have a light scent. Blaze is a red climber that bloomed far longer than the usual few weeks in June. But the rose I most associate with my mother is the climbing variety of Crimson Glory. 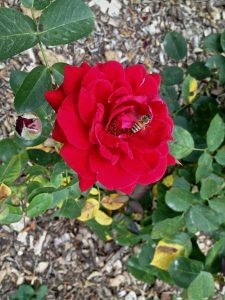 The rose has a deep red, velvety blossom that carries a heady, lasting fragrance. It goes from a beautiful bud to a lovely, well-formed flower when opened. As a child, I liked to pet its soft petals, which probably wasn’t so good for the flower but which delighted me. Peace and Crimson Glory often decorated our kitchen table in summer, scenting the entire room as a light summer breeze came in open windows. A whiff of either still transports me home. Both those varieties can be found in a pocket of the Park of Roses dedicated to older varieties. I like that enclave because the roses there have proved their lasting power. Every year when my dedication renewal comes up, I ask whether either Peace or Crimson Glory is available. So far, they haven’t been. 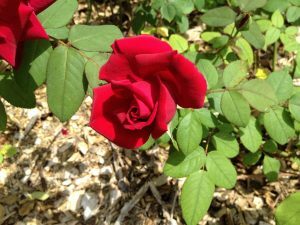 My current bed is planted with Carrousel, a red rose that has a nice scent but is no Crimson Glory. It’s at least my third rose variety since adopting a bed, two earlier varieties having underperformed and been replaced. My Carrousel bed was looking a bit sad on a recent visit and some replanting is planned. If the foundation that manages the park chooses a new rose, I hope it is red and one with scent. Most of the 329 rose beds available for dedication in the park have been claimed, with just eight available late last week. Those dedicating a bed pay $200 initially and a $40 maintenance fee yearly. The cost of dedicating a tree is $300 and an engraved stone, $200. For more information on dedicating a rose bed or other item, contact the Park of Roses Foundation at 614-645-3391. Conclusion: The Park of Roses is worth a visit any time of the year. Beyond the roses, it has well-tended perennial and herb gardens. 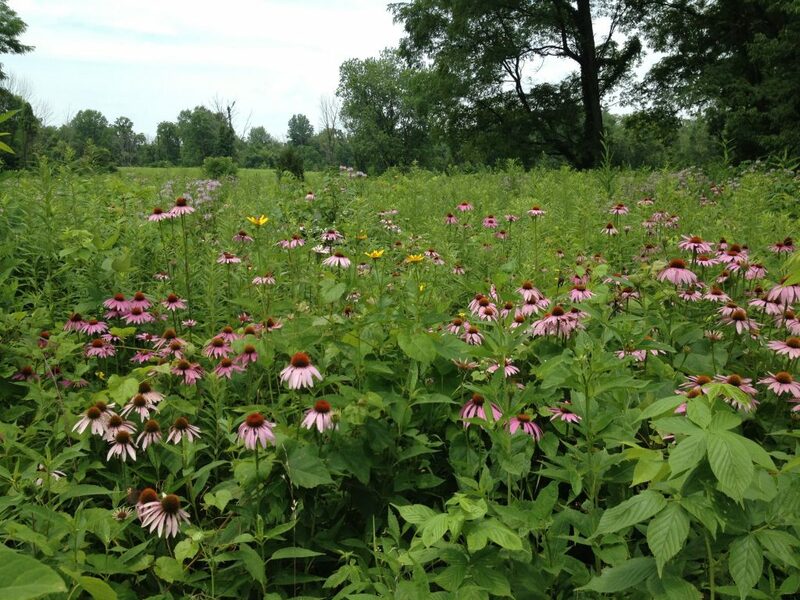 Native wildflowers attract bees and butterflies to Blacklick Woods Metro Park. Just like the citizens of central Ohio, Metro Parks are a wide-ranging lot, offering everything from herb gardens to strenuous hikes for the 8 million people who visit them annually. In its 19 parks, Metro Parks boasts 200 miles of trails on more than 27,000 acres of land in seven counties. Realizing that I’ve explored only eight of the Metro Parks, I put visiting all of them on my list of goals. First up was Blacklick Woods Metro Park, 643 acres with woods, meadows and vernal pools in Reynoldsburg. This pocket of nature just off I-70 is a place to escape, and even on a Thursday afternoon, a number of visitors walked and biked the paths. The park’s Nature Center is one of the modern variety, encouraging visitors to stop and observe nature rather than merely study static displays. Large windows overlook feeders and a pond, where a duck decoy tries to lure waterfowl. 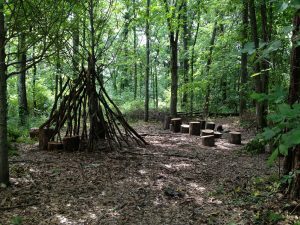 Native plants including coneflowers and milkweed bloom in the gardens outside, and a small area allows children (and any adult who might be so inclined) to play off-trail in the woods. On a cold day, the center would be a great place to while away an hour or so watching birds and squirrels at the feeders. But on a glorious July afternoon, the six trails of the park beckoned. A friend and I pursued all the shady paths, which take visitors through a beech-maple forest and past a wetland still holding water after recent rains. A pair of vocal blue jays flitted about in the understory and other birds could be heard in the canopy. The tree-sheltered trails were a way to undertake outdoor activity without too much sweat on a day with temperatures nearing 90 degrees. But in spring, the woodlands would be dotted with wildflowers. In summer, they were green and lush, with fungi sprouting on fallen logs. I missed seeing one of Blacklick’s most notable features, the buttonbush, a wetlands shrub that sports stunning white starbursts of flowers. I don’t know whether I was too early or too late for the bloom, but it’s one worth seeing, I’m told. Because of the unforgiving sun, my friend and I found the 4-mile multipurpose trail less inviting than the shaded paths even though the longer trail passes a pretty meadow awash in summer blooms such as the native bee balm. We walked part of the path to enjoy a few of the butterflies, bees and blossoms but opted not to follow it to its end lest we bake to a crisp. 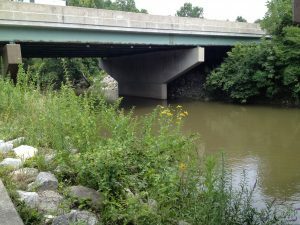 Because of its location, a visitor to Blacklick won’t forget she is in the city. The noise of traffic is never far, and the interstate passes over part of the trail. I thought the loss of silence was a trade-off equal to the convenience of having a park convenient to so many residents. But my husband, who grew up in Columbus, pointed out that when Blacklick was formed in 1949, the area was well outside the city. And I-70 wasn’t built until the late 1960s. The population of central Ohio has grown around Blacklick, helping it morph into an urban retreat. All six of park’s trails are rated “easy” and are accessible to those with disabilities. The park also has a golf course. For more information on Blacklick, visit www.metroparks.net/parks-and-trails/blacklick-woods. Conclusion: I will return to see the buttonbush in bloom. 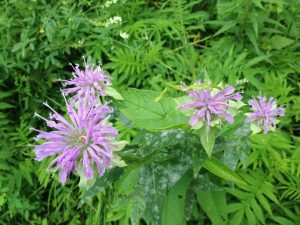 The native bee balm is a soft lavender and attracts both bees and butterflies. Interstate 70 runs over part of the park. A natural play area was created outside the Nature Center. 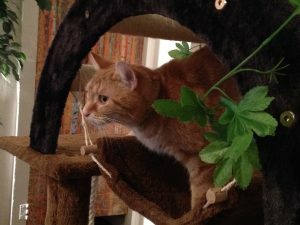 Blake, the cat almost renamed Crush, climbs into one of the cat trees. Key recorded blackmail evidence that I must hide from my own cats. 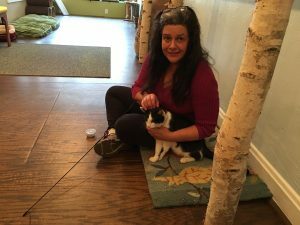 My friend Key and I decided three things after a visit to Eat, Purr, Love, central Ohio’s first cat cafe. No. 1. An hour really is long enough to play with kittens and cats. No. 2. If you find a cat that you might want to take home, don’t dally with your decision. 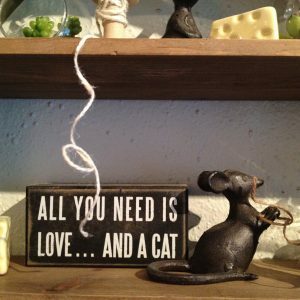 The cat might be adopted before you act, even if you have picked out a really cool name. No. 3. The coffee and tea might be a little expensive, but the money goes to a good cause. Passing pedestrians are likely to see cats in the wide storefront window sleeping on pillowy beds or watching birds in the trees across the street. The felines are a contented lot, living in a space outfitted especially for them. They have places to hide, things to climb, toys to bat and soft spots to sleep. They even have an exercise wheel where they can work off those stubborn extra ounces. 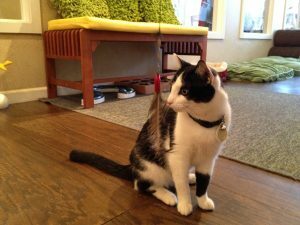 Human guests to the Cat Lounge pay $10 to spend an hour with the animals, after signing a waiver that should make a person ponder whether she is going to meet domestic felines or rampaging tigers. When I booked our visit, I wondered whether an hour was long enough to get to know the dozen animals at the cafe. It was. Just because I love cats didn’t mean I clicked with all of them. I made three friends quickly, including Keeper, one of the resident cats who is definitely NOT up for adoption. Keeper played fiercely and energetically, jumping and running until near collapse as he chased his feather on a stick. Along with him was a gray and white kitten about 9 months old who joined in the play. Neither of the cats had any interest in being petted. They were barrels of energy ready to move. The kitten was a bit skittish, as if not used to being that close to strangers. Still, all the cats were more social around strangers than either of my own would be. My cats vanish. I made my way around the room, petting or talking to animals curled on couches and sitting on sinks. I moved along from most quickly. Then I spotted a big orange tiger resting behind a sofa. As I sat at the adjacent table to pet him, he did something unusual for a cat: He climbed into my lap for more. The nearly 2-year-old male named Blake was sweet, loving and beautiful. He was lithe and athletic, muscular and trim. As I had with some of the other cats, I wondered how Blake had come to be in a shelter; he obviously had been loved and cared for. But the cafe didn’t have the backstories on the animals, and people have many reasons for surrendering an animal. Key, who adopted her own orange tiger last year, was enchanted by Blake but unsure whether lady Clementine would be willing to share her home with some big bossy guy her mom had just picked up. By the end of the hour, I was ready to go. Blake had had enough petting, and my playful friends had crashed and were sitting quietly. The remaining cats were being entertained by eight other human visitors. Talking to the other guests, I found that none of us had come expressly to adopt an animal. One family was in town from Alabama and simply killing an hour. One couple was merely satisfying their cat craving, unable to bring a pet into their rented apartment. Over the next few days, Key talked to Clementine about a possible stepbrother but the tiny cat gave no clear response. In a week, though, Key had decided Blake should be rechristened Crush, as in the soda Orange Crush, to keep with his coloring and her love of food-themed names. But when she called the cafe to make adoption plans, she found that Blake had been spoken for. Although many cats at the cafe are several years old and the kittens tend to be teenagers, they are adopted quickly, a staffer said. T o arrange a visit at Eat Purr Love or for more information, visit eatpurrlovecatcafe.com. Kitschy decor accents the lobby. 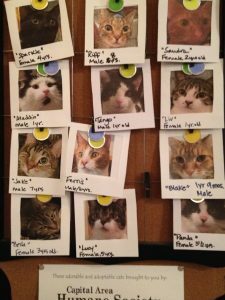 A bulletin board shows cats up for adoption. Conclusion: Cats bring happiness. I will return. A cat takes a moment to catch its breath. What I expected to be a simple night out a few weeks ago – a one-and-done kind of activity – took an unexpected turn into discussions of audience behavior, expectations, and, well, what constitutes fun. 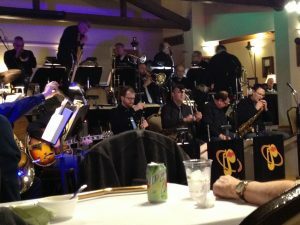 The performance by Vaughn Wiester’s Famous Jazz Orchestra at the Clintonville Women’s Club fell into the category of “things I didn’t know that I don’t know” (which is a large category indeed). Evidently, I went into the event with one gigantic misconception. I thought that because the orchestra performs weekly in a social club – an event that has been going on 20 years – the atmosphere would be somewhat casual. Food is served, and guests may bring in alcoholic drinks. I expected the music to be dominant, of course, but I also expected talking, laughing and perhaps even some dancing. The extremely talented 22-member orchestra plays fun big band pieces, prompting toe-tapping and wriggling in one’s seat. I couldn’t complain about the quality of the music. But I didn’t interpret the event as being a stage performance like what I would find at the Ohio or Palace theaters. Even with the $10 cover, I interpreted it as a club, a place for fun versus a place for intense study of musical theory and arrangement. I seem to have been in the minority on that viewpoint. I drew the stink eye from three older women when I tried to carry on a conversation with a table companion whom I had not seen in months. From then on, I sat stoically face-forward in a kind of forced attention to the band. And that just felt wrong and truly un-fun. The event was well-attended, and audience members enjoyed the well-executed pieces. But I left wondering what was more typical. No talking during the show? Or using the (very nice) music as background? I took my question to three friends who know music well: my cousin, who plays trumpet with nine bands (and sometimes, he says, even gets paid); a pianist who performs in the Washington, D.C., area; and a friend whose father was a well-known jazz performer. What they agreed was it all depends on the venue and audience expectations. Ed Wiley, owner of a North Carolina restaurant that used to offer live jazz, gave the explanation that most closely dovetailed with my thoughts. “The thought is that jazz musicians, as the purveyors of America’s only classical music, deserve the same deference as those who perform European classical music. I have seen jazz musicians walk off the stage and refuse to return until the house cleared for the next show. The local orchestra is beloved, and the event is an affordable night out. I think I ran afoul by not understanding the social code of the particular event. Conclusion: I probably never need to go back unless the event loosens up. The staff started snatching linens off the tables within minutes of the band’s last note, before we’d even said a goodbye to table companions. 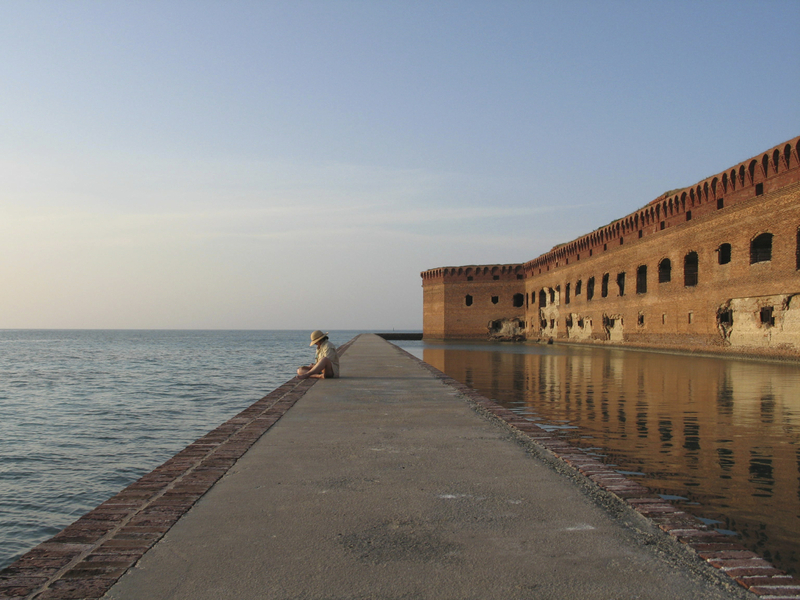 Cindy Files chronicles the ranging experiences and musings of its author. No animals were harmed in its making.